This trail is our favorite wild garden spot, combining the soothing sounds of the creek’s cascades, waterfalls, and pools with flowers along the entire trail. It’s a cool place on a hot day and a great hike to share with out-of-town friends. From the moment you pass through the boulders at the trailhead and cross the wooden bridge you will be surrounded by dozens of varieties of wildflowers of all colors. The trail is moderate; however it steadily climbs to a rocky knoll at about 1¼ miles up the trail from the trailhead. For a longer hike, the trail continues up Baldy Mountain to a ridge overlooking the surrounding drainages. From I-90 and the North 7th Avenue overpass, drive 2 miles north on the Frontage Road to the light at Springhill Road. Turn right and continue 3.4 miles to Toohey Road. There is a sign for Middle Cottonwood Creek. Turn right on Toohey Road and drive 1.7 miles to Walker Road. Turn right on Walker Road. Walker Road turns left at about ¼ mile and becomes Saddle Mountain Road. Stay on this road for about 3.2 miles to the Middle Cottonwood Trailhead. [Note that Walker makes a left turn and becomes Saddle Mountain Road. 1.7 miles to Walker road. Turn right again and continue about 3 miles to the trailhead parking area at the road’s end. [Alternately, the trailhead can be reached from Sypes Canyon Road, turning left on Sumner Cutoff Road and then right on Saddle Mountain Road to the trailhead.] The trailhead is clearly marked; in the summer, there is a port-a-potty maintained by the Forest Service. You will see white geraniums (Geranium richardsonii) in the shade of the serviceberry and chokecherry bushes. As you emerge into the sun just after crossing the creek, the hot pink of sticky geranium (Geranium viscosissimum) will catch your eye among the arrowleaf balsamroot (Balsamorhiza sagittata) and low larkspur (Delphinium bicolor). 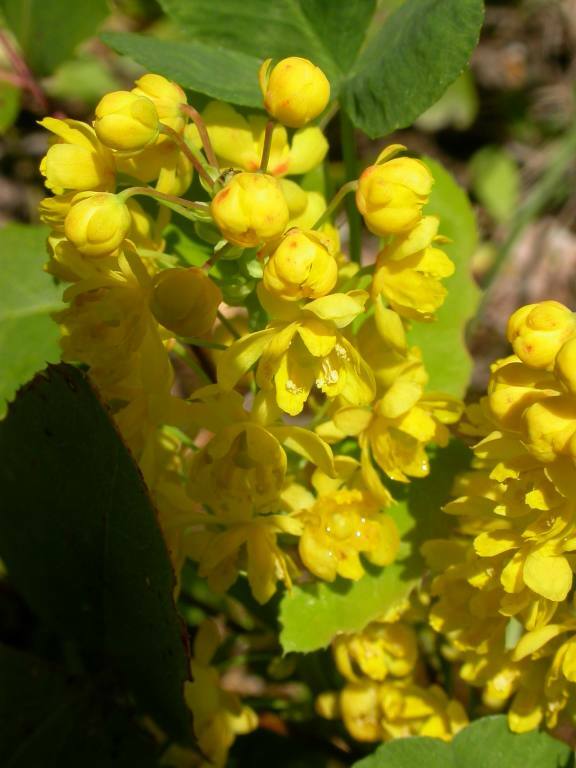 Wild (yellow) buckwheat (Orobanche umbellatum) is scattered among the grasses and Oregon grape (Berberis repens/Mahonia repens) with its holly-like leaves and small yellow flowers is in the more sunny areas and also in the cool shade under fir and spruce. As the canyon narrows, there are colorful rock formations with lush vegetation and moss covered rocks. These hanging gardens remind us of trails in the Cascades where ferns and mosses cover the landscape. The earliest show in May will include yellowbells (Fritillaria pudica), few-flowered shooting stars (Dodecatheon pulchellum), biscuitroot (Cous) (Lomatium cous/L. montanum), and a few yellow glacier lilies (Erythronium grandiflorum). 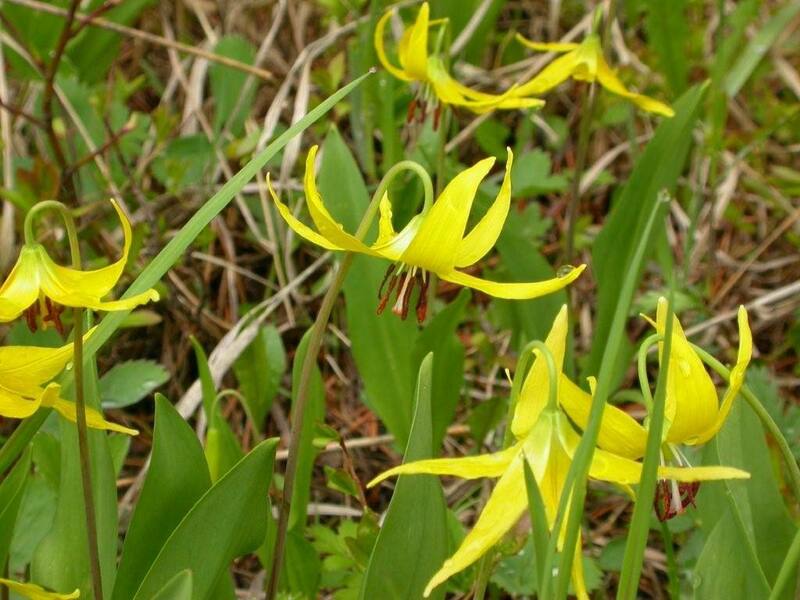 At the end of May, carpets of glacier lilies are under all the bushes from the beginning of the trail up to the knoll after the junction with the trail that heads south toward Sypes Canyon Trail and the “M” Trail. Brook saxifrage (Saxifraga arguta/S. odontoloma) is sprinkled in wet areas where springs and runoff trickles across the path, and yellow columbine (Aquilegia flavescens) is scattered along the creek in the sun and shade. Keep and eye out for the striped coralroot (Corallorhiza striata) and spotted coralroot (Corallorhiza maculata). Some are hidden under huckleberry bushes and some love to be near the Douglas fir. The trail zigzags up the hill to the knoll through silky lupine (Lupinus sericeus) and silvery lupine (Lupinus argenteus). On the knoll you will find Parry’s townsendia (Townsendia parryi), taper-leaved beardtongue (Penstemon attenuatus), lance-leaved stonecrop (Sedum lanceolatum), common paintbrush (Castilleja miniata), woolly groundsel (Senecio canus), alpine pussytoes (Antennaria alpina), and rosy pussytoes (Antennaria microphylla/A. rosea) scattered on the dry hillside and rock outcroppings. Walking with the rushing sound of the water and birds singing is like heaven on a hot summer day. There are lots of places to stop, take off your shoes and socks, and put hot, trail-weary feet into the icy, clear water. Your dog friends will love this trail too! Trails may be open to mountain bikes and horses. Check with the Gallatin National Forest Offices or refer to the signage at the trailhead. Dogs are not permitted off-leash on some trails.The trail includes several creek crossings: one bridge, and a couple of places where you will have to “rock-hop” across the creek. In early spring (May) this crossing may be more than only the experienced hiker will want to tackle. But you can still enjoy the flowers up to that point and then turn around. This is one of the few trails where the creek follows the trail for most of the hike. Photos on this page (Top to Bottom): taper-leaved beardtongue, yellow columbine, Oregon grape, Parry's townsendia, shooting stars, glacier lilies, star-flowered Solomon's seal. Click to enlarge. 6-28-09 We continue to love this trail. Today the sticky geraniums and Canada violets were at their peak. The arrowleaf balsamroot was about done with a few flowers hanging on in the shady areas. Little mountain sunflowers are starting to bloom. The usual flowers were there including bluebells, yarrow, lupine spp., Wood’s rose, yellow columbine, false Solomon’s seal, striped coralroot, white (Richardson’s) geranium, low larkspur, bedstraw, Oregon grapes, rosy pussytoes, and bladder campions. 9-06-09 Most of the summer flowers are over and now comes the foliage and fruit show. The only flowers we saw blooming today were late lupines, fleabane, blazing stars (on the way to the trailhead), spirea, asters, and a few bee balm, and harebells. We were treated to a display of white snowberries, red rose hips, blue Oregon grapes, black chokecherries, orange mountain ash berries, and neon-day-glo red-orange wartberry fairy bell berries. The chokecherry leaves are turning red, the dogbane yellow, and the Oregon grapes leaves are turning red. The grasses all have see heads and add the yellow to beige understory in the open areas. 7-18-10 Each year is different in the timing and proliferation of the flowers. Today the bee balm was spectacular along with large blooming mountain hollyhocks. The usual sticky geranium, common yarrow, and later flowering lupine spp. put on their show. In lesser quantity, but showy nonetheless, were the white northern bedstraw, red clover, common harebells, Drummond’s anemone, yellow columbine, twisted-stalk, Canada violet, heartleaf arnica, red short-styled onions, western coneflowers, white bog orchids, Richardson’s (white) geranium, birchleaf spirea, Wood’s rose, healall, and golden aster. 6-12-11 Flowers are a couple of weeks late due to heavy snows and cold weather. Today was 60° with rain. Four fishermen were trying their luck in the roaring creek next to the trail. Arrowleaf balsamroot and ballhead waterleaf were the flowers of the day. We could only hike to the large stream crossing since we weren’t wanting to wade in knee length water. A surprise was finding a few calypso orchids on the steep moss and fern-covered hillsides to the right of the trail about ½ way to the top. Remnants of the heavy snow were seen in snow banks along the steep hillside. We saw lots of Oregon grape, meadow rue (in full bloom), rock clematis, starry Solomon plume, Canada violets, small-flowered woodland stars, and wartberry fairy-bells. A few chocolate lilies were blooming along the trail. Other flowers in bloom included field pussytoes, baneberry, and the last of the shooting stars. June is a great time to hike Middle Cottonwood. Flowers are blooming, birds are back, and the creek crossing is a little easier. Watch for ouzels, ruby-crowned kinglets, black-capped chickadees and occasional raptors and ravens. This hike was peak blooming for ninebark, sticky geranium, yarrow, columbine, star-flowered Solomon seal, and false Solomon seal. Other flowers in bloom included white (Richardson’s) geranium, low larkspur, Canada violet, wild (woods) rose, cinquefoil, arrow leaved balsamroot, field chickweed, colommia, alpine star, lupines, lemonweed, Rocky Mountain iris, death camas, striped coralroot, blue violets, ballhead waterleaf, rock clematis, bluebells, Oregon grape, many-flowered stickseed, short style onion, western coralroot, twisted stalk, and wartberry fairy-bells.